This text was written during the course of the growing European social war, and our attempts to situate ourselves in the context of that, whilst in the midst of rising fascism, complicity from most of the society and a fractured and divisive anti-capitalist ‘movement’. These scant few pages cannot express the complexity of the various situations being described in any great depth, but we write so that other rebels at the edges can know how it is for us here. As we were putting the final touches to the text, cities in the UK exploded and remain volatile. However this is not an analysis of the riots – this is a text from inside the social conditions which gave rise to the insurrection. This text has been collaboratively written by many individuals in our network over a period of discussion, planning and attack. We have been brief in our communiques so far, but we felt it was time to write something longer. “Why are we writing?” Because we know how important it has been for us to hear the knocks on the wall from other renegades in other cells, and because we would like to reach out beyond the people we already know, beyond the realities we have lived in, created, abandoned or remain tied to. As revolutionaries, we are highly critical of these realities and of ourselves, and we write because just, as individuals, we strive to be ‘better’ than we are, we also desire for this world to be better than it is. We are open to the fallacy of our opinions and wish to surpass our expectations, such as they are. We also try to communicate with those outside our circles, and we attempt to staunch the tendency towards self-referentialism which is endemic to many forms of communication. In the end, we have to accept that this text is written to persons unknown and that wherever it is read and whoever it reaches, there will be those who will have an understanding of what is written here – and this is for them. There is no longer any sure statement that can be made about this changing world, which catches fire more and more, everyday. The present day United Kingdom is a controlled theme-park, covered in surveillance cameras, vehicle tracking, identical housing estates, post-industrial zones and sprawling road and train networks. There is virtually no wilderness left, the powerful and rich control the ‘countryside’, as much as, or even more than the cities, and there is little freedom beyond the mainstream, unless you take it – the same as anywhere else. The prison of everyday life is so total here that the only choice remaining is its complete destruction. We welcomed the renewed call by the Conspiracy of Cells of Fire / Informal Anarchist Federation for a world-wide informal anarchist structure based on revolutionary solidarity and direct action: the International Revolutionary Front. 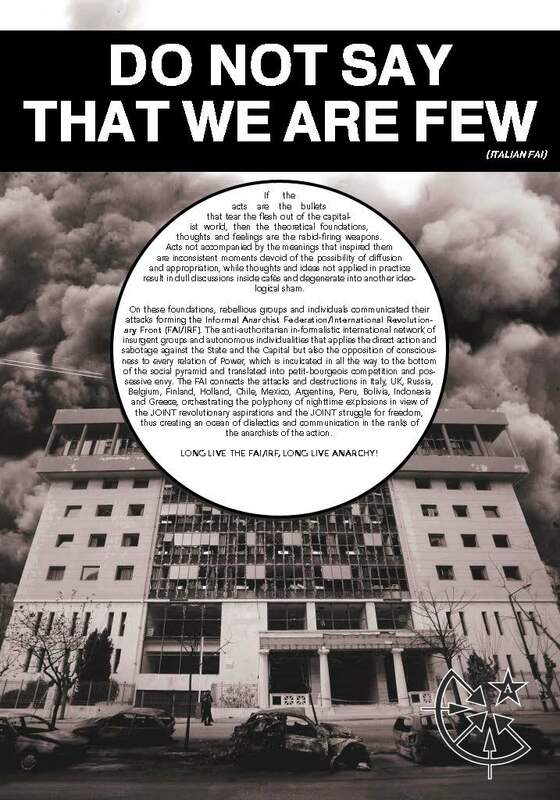 As we continue to develop our own project of revolutionary organisation, we affirm the global informal ‘network’ or ‘federation’ of revolutionary groups in existence who are developing, encouraging and participating in uncontrollable confrontation against State and Capital, whilst organising and developing their own initiatives of attack: this is our signal of collaboration. 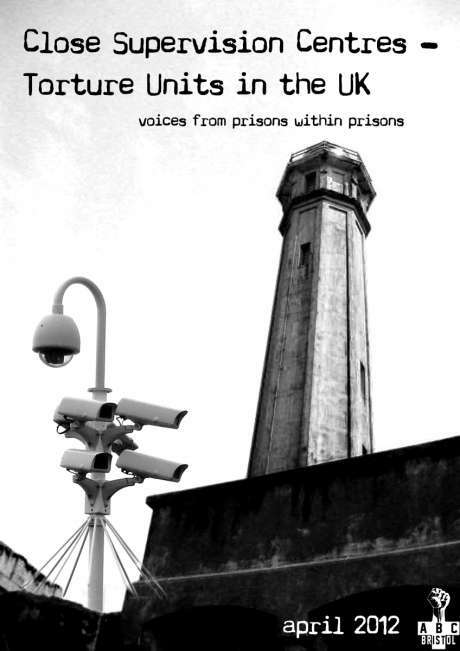 There has been a significant upsurge in attacks against prison, financial, police and communications targets in the UK, but the obvious truth is that these attacks are few in relation to the task to be undertaken, and the level of engagement with the enemy is still in the early stages of its development. Over the last two years we have begun a newly co-ordinated revolutionary project. It is our way of starting something new. Something that won’t just disappear like words against the wind. We are some of those who think that the possibility of a conscious, cohesive social revolution involving a critical mass from the general population of the UK is frankly remote. However, we think – and have seen – that widespread chaos and social insurgency are inevitable, and from this, new and better forms of human values could emerge. If we were to reflect on human life experience – both individual and collective – we would perhaps understand the wisdom that sometimes it takes a total breakdown for things to change. Of course, some people are scared of change, of the unknown. People limp along miserably in all sorts of dysfunctional conditions for years – relationships, jobs, towns etc. – rather than face the necessary and radical alteration of those conditions into a future they cannot yet imagine. And because society is made up of individual human beings, then society is no different. People lap up the distractions being offered – TV, consumables, mainstream cultures, drugs, subcultures, actions, gatherings, spiritual panaceas, anything… so long as they can put off confronting the essential emptiness of everyday life. We are living in the midst of a culture where endemic use of anti-depressants, for example – as Aldous Huxley predicted in Brave New World – keep people from changing what is making them unhappy and instead make them accept what it is that is making them unhappy. When the individuals in a society are struggling just to get up in the morning because the system exploits them every minute, these people have no energy to revolt against the system. They are caught in its claws. They don’t even seem to recognise this. The totality of this techno-industrial society enslaves them into patterns of repetition, damaging themselves and each other, oppressed on the outside and repressed on the inside. The fundamental distinction between inside and outside prison does not seem to exist in the same way any more: daily life attempts to subject us to a regime of control and routine in every aspect. In the foyers of the supermarkets and the shopping malls, in pubs and bars, places of work and transport hubs we find, more often than not, those whom the consumer democracy has bought off with the looted capital of those less fortunate. Regularly, we are in the presence of willing captives, of society’s sickness, of reactionary grasping for the means of survival – the exploited against the exploited. People have made a fool’s bargain and have handed over their health, intelligence, curiosity, sense of solidarity, personal authority, and the earth and all that lives and grows on it in exchange for the latest technology, fast food, flash car or social network. Although present reality shows us an intensification of social conflict with some promising characteristics, we do not yet see ourselves standing amongst a potentially revolutionary mass. We appear to be standing knee-deep in the bloated carcass of a dying civilisation. Almost seven billion people across the world are hooked into a genocidal and tyrannical system that has insinuated itself as a life-support machine. Civilisation gives the impression that its destruction would mean the end of all life; however an extinction wave is already happening which, if it did continue, would have that exact result, accompanied by near total-victory for the capitalist techno-industrial-military system and the financial power which underpins it. Environmental catastrophe roars across flooded continents; vast tsunami, extensive desertification and decimated forests. The modern totalitarian nation-states and their imperialist groupings like the G8, G20, NATO and so on, are committed to the murderously terrorist capitalist system as their vision of the future. To a future where everything and everyone is a commodity logged and valued in a mechanical world devoid of any possibility of wildness and freedom. A world of perfect control and domestication. An impossible world. A world which every sane human being and wild creature already fights against – from each and every area regardless of race, creed or species. We are in the midst of an unprecedented ecological collapse. Various tendencies in the scientific and political communities have spent many years arguing amongst themselves as to whether global warming is or is not a result of human behaviour, citing natural disasters and mass die-offs in pre-history. These arguments are now irrelevant. It is undeniable that grotesque species extinction, habitat loss, light/noise and air/land/oceanic pollution on a worldwide scale, desertification, human encroachment on wilderness are a direct result of human attitudes and economic greed. For decades, changing this was a possibility, now it is too late. We are witnessing our species suicidally contaminate and destroy its own habitat and that of every other species on the planet: an expanding population which prioritises itself and its own prescribed and enforced lifestyle above all other considerations, living in complete disharmony with the natural world and destroying the fragile eco-system upon which we depend. The built environments we inhabit are unsuitable even for humans. Land that used to be covered in forest, supporting a wide range of species, becomes ever more covered in concrete. Every available piece of ‘wasteland’ is being sold off for development. Civilisation is genocidal, homicidal, ecocidal and suicidal. From poverty, abuse and domestic unhappiness to the reckless drivers risking pile-ups to get home a couple of minutes faster, to the regular ethnic cleansings and the total pillage of the environment in the scramble for money and control through the securing of natural resources to exploit. This is a violent system, and millions are dying as we speak, here and everywhere: of obesity and malnutrition, of traffic accidents, industrial diseases, war, substance abuse, depression and loneliness. Meanwhile, the comfortable arrange their knives and forks and settle down in front of the television; their empty, meaningless conversations blurring into hollow silence. These modern societies have come to mean that dreams and desires are warped and dictated from birth (work ethics, conformity to roles, competition, separation, jealousy, class and social deference to authority, the nuclear family, domestication); so much so that it is hard to even know what our unconstrained lives might look like when the State and Capital’s projects and rule are finally rejected en masse. In Britain, there is a massive amount of class anger encountered every day, but until 7th August 2011 when rioting erupted in London and swept through the country, there has been barely any widespread manifestation of this anger against the capitalist system or government. There is a sheepish terror amongst the people here that gets into the bones, and although there is a desire for destruction and for attack, there is also a deep fear that paralyses. A consensual censorship exists, between almost every strata and structure of society, that prevents even the ability to express and manifest dissent unless it is within permitted parameters. In such an advanced surveillance society, when the risk of getting caught even for writing some rebellious words on a wall is so seemingly great, it is easy to give into the fear and to imagine that it is a fact that you are going to get caught. The surveillance technology is extensive and reaches inside – if you let it do so. That’s why we love the ‘feral underclass’ who the politicians and their police despise, those who lost their fear from growing up in a police-state – because that is what Britain is, a police-state. And like any police-state, it only exists because of a vast consensus of subservience from the society. 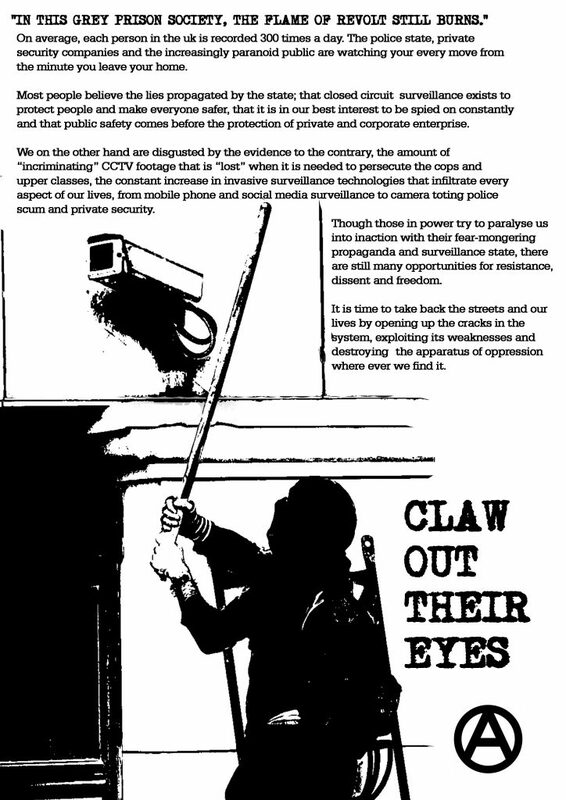 Who has let the social terrain become overrun with surveillance technology? Who has become the eyes and ears of the State? Who turns their own children in to the authorities? Who has watched the Muslims and immigrants become vilified without acting? Who has let the police become embedded in all aspects of the ‘community’? Who has accepted their own powerlessness and swallowed the lies of the media, allowing the politicians to manipulate them and the bankers to rob them? It is the “citizens” themselves. The reactionary mass of people here are lost in comfortable illusions, bought off by the delights of consumerism. They put out of their minds any actual realities of oppression or exploitation. Of course, they feel deeply the misery of their daily grind, but here they make the bosses’ choice: to be angry with the immigrants, the impoverished and the marginalised, otherwise amusing themselves with the sports section, the lottery, the televised media spectacle of rivalry and competition. Benefiting from and perpetuating a system of global violence, we have little more than scorn for the waste these people make of their lives. At the same time, the food prices go up, the fuel price goes up, the wages go down, pensions and benefits are cut, mass redundancies are effected (some staff to be rehired if they apply for their old job again, but only at a lower wage). There will be no more inheritance. There will be no more security, even for the nuclear families who bought into the dream of the faded Empire, rotting in sub-standard housing surrounded by decay and breakdown. We see how the technological-capitalist system ties people into ‘needing’ the computer, mobile telephone, car, TV, because putting those things aside means social and cultural isolation and no opiate to bury the alienation, misery and desperation. Nothing exists but a trace of a way of life promised to an elite. The majority are living in debt, and/or hand to mouth; the fortunate are living on their reserves; and the very few are living off everyone else, enjoying the present and securing the future for themselves. We act against the State and the symbols of the State for many reasons. And of course, one of those reasons is a desire to move beyond ourselves and our small circles. We hope that these attacks will resonate with others and will spread, and indeed they have. We are not so stupid that we think our attacks – however worthy the targets – will alone bring down this system. We understand that there are other social factors which are necessary. We know that the process of planning and carrying out attacks changes our immediate social relations and our relation with our own sense of self and personal power, so that gradually our actions become bolder, wilder, harder to ignore. This process also changes the general atmosphere, creating an environment where more is possible because less is impossible. We have contributed to a whole plethora of anti-system activities, of which repeated attacks by smaller and larger groups over the past year on infrastructure, banks, and prison institutions have played a part. With all the billions of people who live in the world, there will never be a time when a particular act against the State and Capital is felt by all or even the majority of people to be appropriate, ‘good’ or desirable. Our small affinity groups – of two, three or more people self-organised into a larger informal structure – simply act according to their own rage, their own analysis, their own choice and at their own risk. To pretend to be someone other than we are is useless, dishonest and lacking in integrity, a posture which could only slowly devastate us and ultimately any collective project arising from this. By publicising our attacks, we hope to inspire unknown combatants and to disseminate those methods so that they are easy to reproduce by others. This is why we make sure always to communicate them through the independent media, as otherwise there is a media black-out on reporting the claims of sabotage and covering subversive activity in this country, preferring, as it does, stories centred around personalities and the seemingly designed-to-be-unchangeable current political structures. It is important for us who wish to confront and bring down Capital to know that others are attacking the enemy, in order to dismantle any sense of isolation and powerlessness. 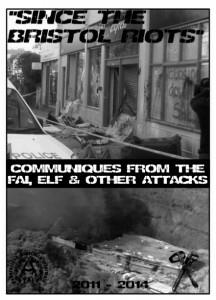 It is vital to organise, communicate and co-ordinate attacks. We are very proud of the relationships we have built as individuals together through our project of destruction, as we are of each of our actions, even those that did not meet our expectations. Each of us are individuals who believe that the fundamental base of a strong and healthy way of life is comprised by the individuals themselves, in their decisions, choices and values that go towards freedom and responsibility. Our project is to quicken the breakdown of society. As revolutionaries, we are a minority – but do not say that we are few. We don’t make predictions as to how society will re-form after the breakdown, although, of course, as anarchists, there are some basic ways we want things to change. And those dreams coincide with those of revolutionaries throughout human history, and indeed they are being realised already across the world. We are bored to death with reflection, statement and opinion – and even of this analysis – on the condition of this society. We must only attack and destroy – which means using revolutionary violence, in our hearts and in our hands, until our freedom to act is permanent. This continuous project of attack is in order also to break down our fears and to heighten the tension that exists, to give it expression. To understand that in a police-state and surveillance society where fear and paralysis are a daily condition, it is still possible to revolt and to attack, to overcome those that have inserted themselves into positions of power based on the obedience of the crowd. We are poised at an exciting time in history, although it seems at times like a most relentlessly depressing one. As the material base of people’s lives is tipped into ever increasing fragility and as the sensation of daily precarity and inequality grows, the results are entirely unpredictable (as we have seen here this August in the widespread violent uprising) and it is exactly at such times that even small acts can have the most unpredictable effect. We want to contribute to the opening up of new possibilities. In a highly symbolic, abstracted and post-modern culture and way of life, and in a situation where even work now is largely providing service and information, there seems to be no end to the targets we can attack – our actions are themselves an exploration. Of what is worthwhile to strike and what is not. Corporations and government targets are attacked across the world in coordinated and constant acts of direct action. Land and property are occupied in defiance of speculators and landlords. Animals are liberated, bio-science laboratories burnt down. Transgenic crops trashed and business people intimidated. Banks and courthouses are blown up, judges shot and stabbed. 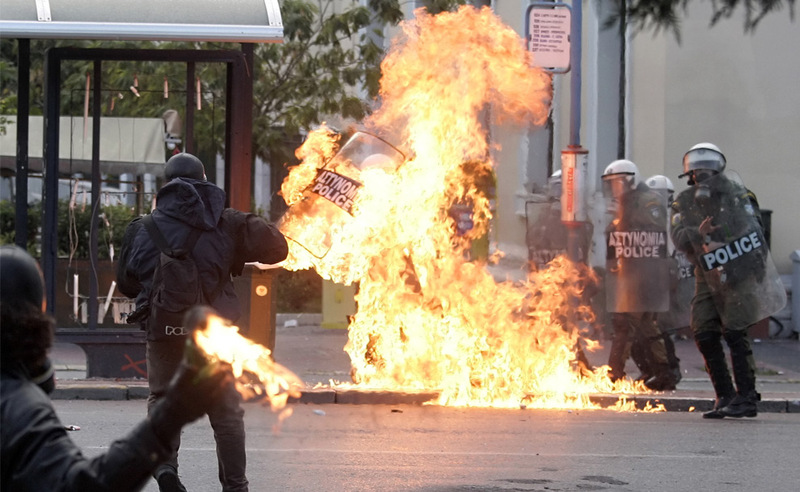 Police and their stations are attacked with Molotovs, sticks, dynamite, firearms. Energy supplies are disrupted, television infrastructure attacked, internet cables and mobile-phone masts sabotaged. Supermarkets and department stores are looted and their products distributed. People go on strike, blockade the economy and occupy their places of wage-slavery; ‘labour’ disappears into the generalised insurrection. Prisoners rebel and overtake their guards, some escape or are freed by their compatriots on the ‘outside’. Communiques of revolutionary international solidarity are circulated by anti-authoritarian, anti-capitalist and anarchist groups of the new urban guerilla war; objectives are discussed, concepts exchanged, methods revealed, tactics refined and words of armed joy and love spoken. A sprawling economic and technological apparatus of social control stutters in seizure and fragmentation. A message to all those who have not yet begun the fight but see the looming clash on the horizon: prepare yourselves, because there is a fierce conflict ahead for the future of our changing world. And this planet is ours. Ours, like the streets of the cities in which we set our barricades. Ours, like the houses, corners and cafés where we meet our friends and accomplices. Ours, like the stones we throw and the fires we set. Ours, like the infinite anarchic dream which wrote itself into existence. 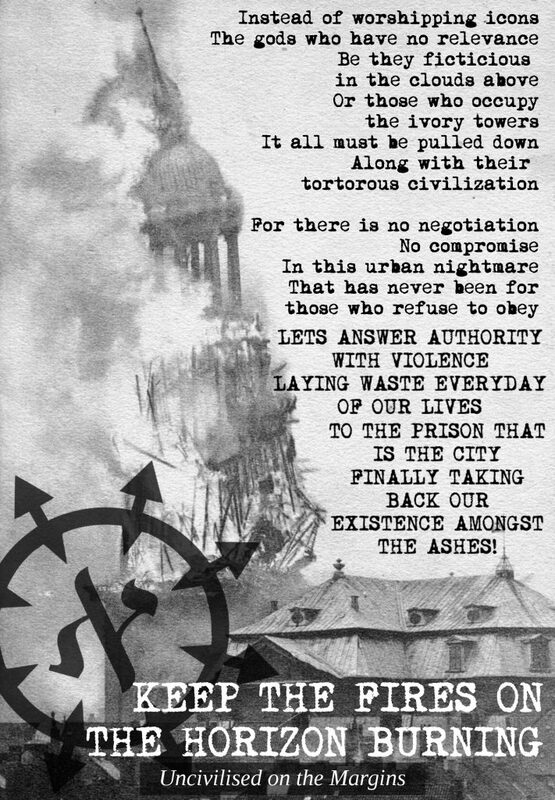 This is a new era of international urban low-intensity war, and our insurrectional project is forged from the multiple efforts of many autonomous and independent combative groups, developing new lines of attack and coordination whilst retaining the individualist character of their own principle concerns and objectives. It’s not enough to rot our dreams with the incontinence of inaction. The future is yours with every dream you make into reality, and every refusal you make concrete. Whether locked down in jail, on the street, or imprisoned in the family or workplace, each moment of your life depends on your ability to scheme and rebel against anybody and anything which tries to put their authoritative hand upon you; you are the future and the world is yours. We send our solidarity and respect to all those fighting against the system around the world and here in the UK. Our love and drive for freedom to all the comrades in prison and also the dignified prisoners who are in rebellion. 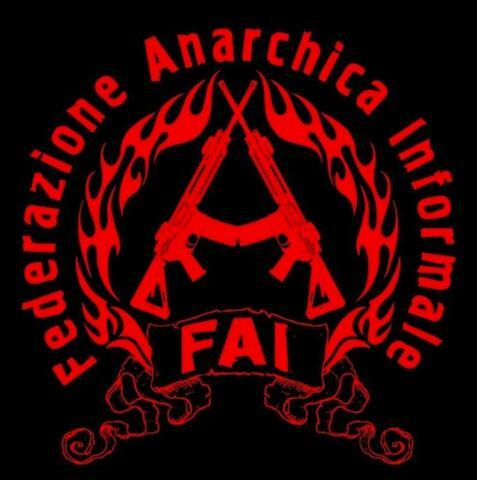 This entry was posted in Informal Anarchist Federation (FAI), Text and tagged Earth Liberation Front, Informal Anarchist Federation (FAI), International Informal Anarchist Federation / FAI, International Revolutionary Front, Rain & Fire, Text, UK. Bookmark the permalink.